Nearly three quarters of American women believe that at work, their voices aren't treated as seriously as a man's. This sad state of affairs was the impetus for this book and for the title, Hear and Now. Clearly a problem of such magnitude needs solving urgently. It's damaging to those involved and damaging to the greater economy. In this book you will learn how to tackle the dictatorial and overbearing communication style that's become the corporate norm. You ll be able to create a happier and more productive working environment, based on greater collaboration, arising from better relationships and a greater level of trust. There are too few female role models for modern businesswomen to follow - this book will help you become one. 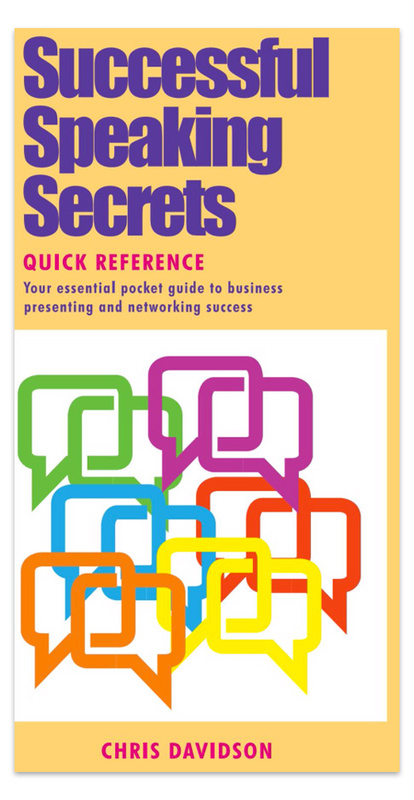 Chris’ award winning book offers tips on business networking and public speaking, presented in a unique, convenient, pocket sized format. This book will help you deliver effective business presentations. Get professional information that helps overcome public speaking phobia and answers the question, why is public speaking important? The 64 pages lead with two chapters on networking, before moving on to public speaking. The main body of the book shows how to overcome the fear of public speaking and would be equally useful for sales presentation training as well as for making the five minute presentation to the weekly staff meeting. Winning Techniques for Public Speaking and Presenting isn't only applicable to people who want to present better. It's an easy-to-read blueprint that contains material that Davidson's been teaching to international clients for well over a decade. Both simple to apply and revolutionary in impact, Winning Techniques gives you skills to achieve your big dreams, win more sales, improve your social communication skills and develop your influence.